Dr. Scott Cline reports from last week’s Society of Petroleum Engineers Unconventional Resources Conference where engineers and geologists noted that advancements in horizontal drilling and hydraulic fracturing are leading to even greater quantities of oil and natural gas being extracted from the nation’s shale plays. This past week I attended the Society of Petroleum Engineers Unconventional Resources Conference in Houston, Tex., where petroleum engineers and geoscientists from around the world discussed cutting-edge advances in shale gas resource estimation techniques and development technologies. Throughout the discussions, one thing was abundantly clear: the shale revolution is just beginning, thanks in large part to technological advancements being implemented in the nation’s oil and natural gas fields. But that is only a part of the story. What’s left untold is that all estimates consider resources that are able to be extracted given the current state of technology. That leaves tremendous room for growth, as the best current technology is only able to recover, for example, less than 25 percent of natural gas entrapped in shale. This means that most of the available energy in any given shale play will be left in place if we assume zero technological advancement. But remember: It wasn’t long ago that folks were saying the exact same thing about virtually all of our shale and “tight” resources. Technological advancement is not a fait accompli, but to assume it won’t happen at all is to ignore history entirely. So with that as background, let’s examine the effect of technology and the historical miscalculation of its importance in increasing our nation’s hydrocarbon reserves. The figures below compare the U.S. Energy Information Agency’s (EIA) 2000 report with its 2012 outlook. 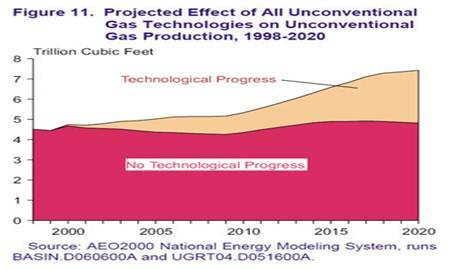 EIA recognized the emergence of unconventional resources in 2000, but vastly underestimated their future effect: EIA estimated in 2000 that, by 2010, technological improvements in unconventional resources might add only about one tcf to natural gas reserves, for a total of about five tcf per year from unconventional sources. Fast forward to EIA’s 2012 report and we see that actual 2010 production from unconventional resources was double the predicted amount, and is now projected to increase even more rapidly. This is an important fact to keep in mind. Estimates suggesting the United States has a 100-year supply of natural gas are based on “current” technology and, more importantly, exclude the possibility of technological advancements. How Can We Get More Resource Out of Shale? So what is leading to the continual increases in recoveries per unit volume of rock and where are we likely headed? This was the primary topic of the SPE conference. To understand this in greater detail one needs to understand the shale reservoir from which natural gas is being extracted. Three-dimensional visualization of a shale-gas reservoir. Because of the quadruple porosity system – consisting of low permeability matrix porosity coupled with organic porosity, natural fractures and induced hydraulic fractures – the flow regime from shale is complex. Without breaking the low permeability matrix into smaller blocks and connecting each of them with high permeability fractures, much of the natural gas will be stranded and unavailable for production. Horizontal wells with hydraulic fractures have been successful in solving part of the problem, but it’s only one step in a much larger extraction efficiency story. Advances in drilling, integration of petro-physical and geo-mechanical data, proppant technology and production process advances are leading to ever increasing recoveries. Further, shale is not homogeneous, so targeting the part of the shale with the largest resource is critically important. Advances in drilling with rotary steerable assemblies, diamond crystalline bits and logging are allowing the steering of wells to target the rock with the best hydrocarbon potential and best fracture ability. Simply put, these kinds of technologies are significantly improving production per well. The latest experimental development in this regard is utilizing complex well trajectories, with multiple horizontal legs radiating from the main horizontal to increase the surface area contact with the geological resource. This allows for a greater area to be targeted, thus allowing for increased production and a reducedneed for fracture stimulation. Drilling multiple branched wells rather than a single horizontal well may also help target previously un-stimulated areas of shale rock identified by combining microseismic, 3-D seismic and flow data from individual perforation clusters. Adding to this, research into newer proppants with even higher strength, lower weight and better transport ability coupled with new injection schemes are enabling better proppant placement. Again, to put it simply, this development mean increased production from each well, which in turn means more energy produced with less surface impact. Advancements in horizontal drilling and hydraulic fracturing are also responsible for a surge in U.S. oil production. From a steady decline between 1970 and 2008, U.S. production is rising once again thanks to the combination of these two technologies. As is the case with natural gas, considering we are only extracting less than 10 percent of the oil-in-place in shale reservoirs, there is enormous potential for increased production. In fact, some presenters at the SPE conference believed that North America could even be self-sufficient in oil, assuming wide adoption of natural gas in the U.S. trucking fleet and continued increases in oil production by our neighbors in Canada. Despite these significant advancements, there was one overriding concern at the conference. Namely, the challenge of finding enough people to fill all the open jobs created by the oil and gas boom. One approach in correcting this problem, however, is already being implemented in Houston, a city widely viewed as the energy capital of the United States. Efforts are underway, for example, to provide training to high school students interested in working in the nation’s oil and gas fields. The Houston Independent School District recently added an Energy Institute High School to provide rigorous scientific training geared to students interested in the energy field. The magnet school will partner with the Independent Petroleum Association of America, which will lend practical experience and training. Three years ago I wrote the Coming Age of Natural Gas in which I expounded on the natural gas opportunity and soundly criticized naysayers like Niall Ferguson (Harvard University) for his “predictions of the collapse of the American Empire,” taking into account the economic progress that shale development would provide. Ferguson is right. 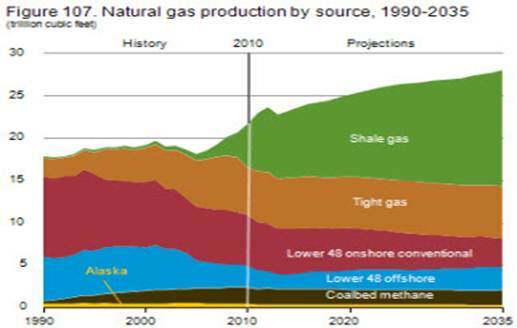 The age of natural gas is no longer coming; it is here and it’s expanding. In the process, it’s bringing our nation phenomenal opportunities for cleaner air, reduced carbon emissions and increased economic vitality. And it’s all made possible by that unique American spirit of innovation and hard work.